On 11th April 1609 a new two storey shopping mall with basement wine cellars opened on The Strand in London and was called The New Exchange or Britain's Bourse. The current street numbers 54 to 64 on The Strand occupy where the New Exchange used to be. To mark the opening the playwright Ben Jonson was commissioned to write a masque by Robert Cecil, the Earl of Salisbury. In the masque the narrator, who is the master of the exchange, announces. "I will read you with this glass the distinction of any man's clothes ten, nay twenty miles off, the colour of his horse, cut or long tail, the form of his beard, the lines of his face.... But I am promised a glass shortly from a great master in catoptrics, that I shall stand with o' th' top of Pauls when the new spire is built, and set fire on a ship twenty leagues at sea in what line I will by parabolical fiction." The master of the exchange refers to this glass in the singular so it is a single lens optical device which in addition can be used as a burning glass. Such types of lens were known in the period and have been described. In chapters V, VI and VII of "Treatise on the Properties and Qualities of Glasses for Optical Purposes" written in 1580 by William Bourne (MS Land 121) he describes a convex lens made of "fine and white Vennys Glass one foot in diameter with the middle not above a quarter an inch and the sydes or edges very thynne". This glass will enable the user to "beholde those things that ys of great distance form them" (Chapter VI) and also to "make a burning beam" (Chapter VII). In Chapter IX Bourne discusses the Digges Perspective Glass but not in any great details as he comments that this description is best left to Mr Digges and Mr Dee who are more knowledgeable in these matters. The problem for the modern reader is that all the "dyvers and sondry sortes of these concave looking glasses" described by Bourne are all Perspective Glasses. In the twentieth century we might refer to a car without specifying the engine type, model or even the number of wheels, or to a shopping centre without defining its size and range of retail outlets and facilities. 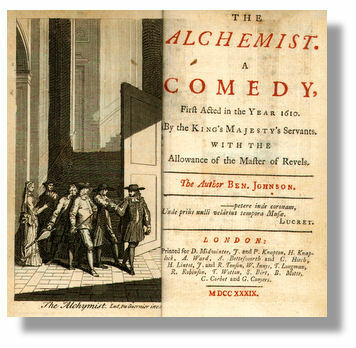 Jonson also mentions a perspective in his 1610 play the Alchemist (Scene 3.2) when Kastril is shown different aspects of the City of London. Hops, or tobacco, oatmeal, woad, or cheeses. To your own use, and never stand obliged." Ben Jonson mentions perspective glasses and telescopes in his later works including News from the New World Discovered in the Moon (1620) and Mercury Vindicated (1615) but by then Sidereus Nuncius had been widely distributed and translated and even pirated!! After Sidereus Nuncius was published astronomy started to become a serious science with its own body of literature and optical equipment and the use of perspective glasses started to decline.